With 85+ years of experience, West Michigan Tree Services has the skill to keep your trees safe, healthy, and flourishing with quality tree care. You can trust in the knowledge of the certified arborists on our team. There are programs to fit all types of foliage and budgets at our locally owned and operated business. The American Elm has been a part of our surroundings for many years. Numerous cities planted them along their streets because of the stately beauty they provided. The introduction of Dutch Elm Disease into our country has slowly killed many of these lovely American Elm trees. Dutch Elm Disease causes a wilting or shriveling and drying out of the leaves and shoots. Affected branches are killed quickly and the leaves drop. One or more branches may be affected, or disease symptoms may develop throughout the entire crown at once. The disease can travel by root graft and can easily affect other Elms nearby. The elm bark beetle carries the fungus disease. The disease is difficult to control. Our American Elm Disease Management Program is recommended as a preventative to decrease the chances of contracting the disease. Fertilization is the first application in the Spring to give the tree the nutrients it needs to maintain optimum health. An injection is the next application. Our certified applicator systemically introduces the appropriate chemicals into the tree. The chemicals can move freely within the sap system of the tree and into the branches and leaves. The injection time varies depending on the soil moisture, weather conditions, or the systemic chemical being used. In September, a spray for the active bark beetle may be applied. Anthracnose is a fungus disease and is perhaps most common to the Sycamore and White Oak trees. Some of the symptoms of the disease are a canker formation (including bud and twig mortality), shoot blight and leaf blight (characterized by browning and shriveling of young leaves during the period of leaf expansion). Year to year weather patterns influence the severity of the disease. Frequent Spring rainfall and moderate temperatures are conducive to outbreaks of this disease. For this problem, an injection is performed by a certified applicator with appropriate chemicals in the trunk of the affected tree. The chemicals can move freely within the sap system of the tree and into the branches and leaves. Fertilization is important in the treatment of this disease because it provides the essential nutrients the tree requires to fight this disease and maintain optimum health. Proper pruning of dead and dying branches is also critical in helping the affected tree to better respond to treatments. DIPLODIA TIP BLIGHT – An injection or a series of sprays. PINE SHOOT MOTH – A series of sprays. PINE BARK BEETLE or BORER – An injection and/or series of sprays. PINE COLLAR WEEVIL – Clean the root collar and spray. Our Birch Tree Program is recommended as an aid in the prevention and control of the leafminer and bronze birch borer. These particular insects are a continual problem to the birch tree and cannot only weaken the tree, but can cause the death of the tree if left unattended. To keep your Birch tree healthy and beautiful, a maintenance program is important. Proper pruning of the deadwood in the Fall is necessary to prevent further insect attraction. Fertilization once a year is a must to provide the proper nutrients the tree requires to fight insects, enhance vigor, and maintain optimum health. See below for the approaches to this tree’s health. Tree cabling and bracing is performed to protect valuable trees. By installing cables, bolts, and/or braces, a tree can be better protected from high winds or ice storms. Trees with multiple stems, splits, weak limbs, or weak points in the wood may make cabling a necessity in order to protect them. Whenever the situation warrants it, your Arborist may make recommendations for this specialized tree care procedure. Tree cabling and bracing is a procedure that should only be performed by a trained arborist. Incorrect cabling can do more harm than good, and can actually make your tree weaker. It is important that this work be recommended by an Arborist and carried out by the tree care professionals. Cabling and bracing are valuable procedures in preserving your mature and irreplaceable trees. Scale insects are a common problem found on several species of shrubs and trees, especially the Euonymus and Mugo Pines. This insect can cause complete defoliation or even death of the affected plant. The symptoms of scale insects are yellowish or white spots on the leaves. Sometimes the whole plant is whitened by the covers of the scales. When this occurs, the plant’s leaves, or needles, may drop and sometimes a normally green plant becomes bare by midsummer. Plants growing close to buildings seem to be damaged more than those growing where there is free air circulation. Our scale insect program is designed to help control this insect and bring the plant back to optimum health. Correct timing is critical in controlling the scale insect because it has more than one life cycle per year. Fertilization is also important to the affected plants as it provides the required nutrients for optimum health. – Proper pruning can be beneficial in the control of this disease. Flowering Crab and hawthorn trees are very attractive trees especially when in flower. These trees are used extensively in landscape design and are a focal point for many properties. Apple scab and leaf spot are common disease problems to these trees. Apple scab and leaf spot are fungal diseases which begin as olive green spots on the leaves and then enlarge and darken. Badly infected trees defoliate by mid-summer. Adverse weather conditions can aggravate the diseases. For control of these problems, we recommend a spray in the spring. 1st Application – this is an early spring fungicide spray. Proper pruning and thinning of the affected tree, removal of sucker growth, disposing of fallen fruits and diseased leaves are also of substantial help in controlling these diseases. Many species of trees are susceptible to a girdling root problem. Most often, we detect this problem in certain varieties of the Maple tree. A girdling root encircles the trunk of the tree and can slow down or cut off circulation in the tree and allows the introduction of diseases. After your Arborist has detected this problem, he will usually recommend a treatment consisting of digging around the tree, locating the problem roots and cutting them if possible. An trunk injection is often performed on the tree. Tree injection is a safe and effective way to treat your tree. Proper pruning of dead and dying branches I also critical in helping the affected tree to better respond to treatments. Follow-up fertilization and inspections are necessary for several years after the initial treatments. Integrated Pest Management is a landscape maintenance program that reduces the amount of pesticides used on your trees and shrubs. A Certified Arborist inspects your property during the growing season, spraying your landscape for insect problems as needed and reports to you any pertinent observations. A foliar fertilization may be applied to weak plants. The benefit of having an IPM program for your landscape is that we can provide you with timely visits from one of our Certified Arborists. 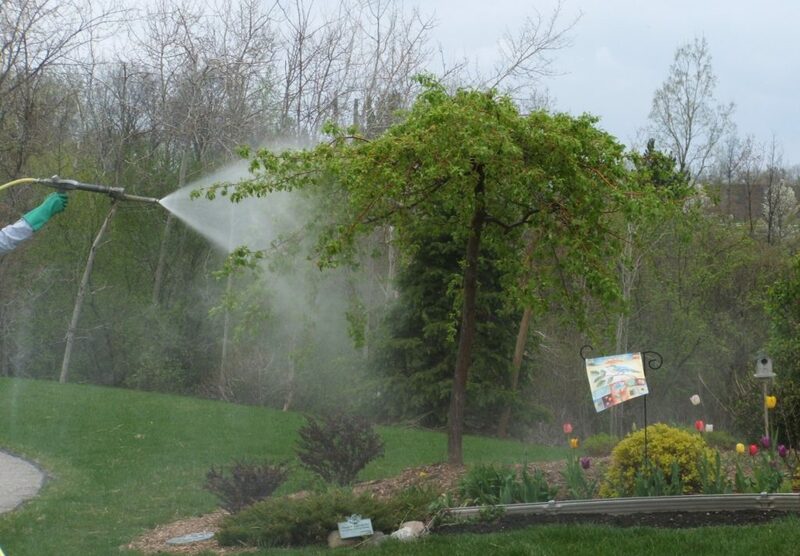 This allows us to spray any trees or shrubs that we find problems with before infestations can build up to critical levels. It also helps to take some of the pressure off of yourself from monitoring your own landscape. By allowing us to routinely inspect your trees and shrubs, we can provide you with an excellent preventative maintenance program and give you healthier and more attractive trees and shrubs. Your Arborist may recommend a tree injection to control diseases, manage insects, and/or to correct nutritional deficiencies. 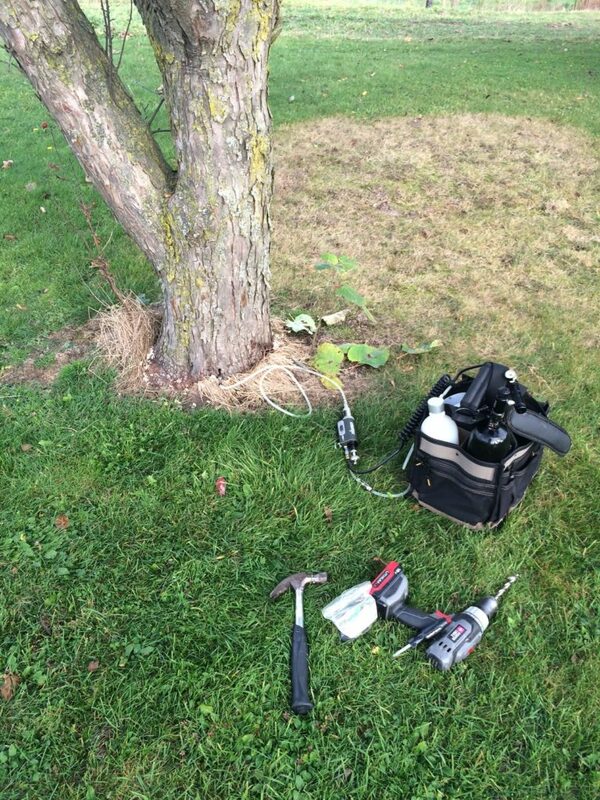 Tree injection is a safe and effective way to treat these problems in shade and ornamental trees. Micro-injection is performed using prefilled capsules or material is infused into the tree using a pump and harness system. Micro-injection with capsules is a closed system. The contents of the capsule are injected directly into the tree by our certified applicator. These capsules contain insecticides, fungicides, or nutrients, depending on the requirement. The contents of the capsule move freely within the sap system of the tree and can be conducted into the branches and leaves. Therefore, it is not hazardous to birds, other wildlife, or beneficial insects such as honey bees and lady bugs. The capsules may empty within minutes or take longer depending on the species of tree, soil moisture, weather conditions, or the systemic chemical being used. Follow-up fertilization and inspections are very important for several years after the initial injection. Proper pruning of dead and dying branches is also critical in helping the affected tree to better respond to treatments. Micro infusion using our pump system allows the arborist to introduce nutrients or chemicals in larger quantities directly into the tree. This delivery system is fast, efficient and effective in correcting many tree problems. Fertilization is the most beneficial service you can provide to your trees and shrubs. Healthy plants can fight environmental changes, drought, insect attacks, disease, severe weather and stress. Our fertilization program introduces nutrients into the soil surrounding the trees and shrubs and unlike some other methods, does not just promote quick greening, but rather stimulates root development. This in turn assists the trees and shrubs in producing new growth and increased vigor. Fertilization is a vital part of tree and shrub maintenance. Healthy trees and shrubs will provide you with many years of beauty and enjoyment.